About 7.0 million people received federally administered payments in December 2004. The average monthly payment in December 2004 was $428. Fourteen percent were under age 18, 57 percent were aged 18 to 64, and 29 percent were aged 65 or older. Despite their disabilities, about 328,000 recipients (5.6 percent) were working in December 2004. The tables on Noninstitutionalized Recipients, which are based on the Survey of Income and Program Participation (SIPP), were not updated for the SSI Annual Statistical Report, 2004. We are preparing and evaluating updated estimates from a special SIPP interview of SSI recipients. 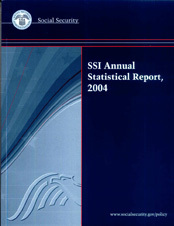 We anticipate publishing those estimates in the SSI Annual Statistical Report, 2005.